The radical Islamist preacher Abu Qatada has been released from jail. Abu Qatada, 47, was freed from Long Lartin Prison, in Worcestershire, at about 2020 BST after winning his fight against deportation from Britain. A senior judge earlier signed papers authorising the release of Abu Qatada, previously described as Osama Bin Laden's right-hand man in Europe. The Palestinian-Jordanian preacher will be subjected to a 22-hour home curfew and tight restrictions on his liberty. Home Secretary Jacqui Smith has said she is "disappointed" with the decision to release him, and says the government will appeal. Abu Qatada was once described by a judge as a "truly dangerous individual at the centre of al Qaeda's activities in the UK". Last month the Court of Appeal blocked his deportation to Jordan, where Abu Qatada has been convicted in his absence of involvement in terror attacks. Appeal Court judges feared evidence gained from torture could be used against Abu Qatada in a future trial. Mr Justice Mitting of the Special Immigration Appeals Commission (SIAC) granted Abu Qatada bail on Tuesday with strict conditions. He must wear an electronic tag and must not attend a mosque or lead prayers or religious instruction. Abu Qatada must also stay in his west London home for at least 22 hours a day, and cannot attend any kind of meeting. He is also forbidden from using mobile phones, computers or the internet. Police have special permission to enter and search his home while Abu Qatada is banned from having guests other than family and solicitors. Among the people he is banned from meeting in London is al Qaeda leader Osama bin Laden. Others include bin Laden's deputy Ayman al-Zawahiri and Rachid Ramda, who has been convicted in France of masterminding a series of bombings in 1995. Also named is hate preacher Abu Hamza. Ms Smith said she was disappointed that Abu Qatada had been granted bail, even though the conditions were strict. She added: "I am appealing to the House of Lords to reverse the decision that it is not safe to deport Qatada and the other Jordanian cases. "The government's priority is to protect public safety and national security and we will take all steps necessary to do so." 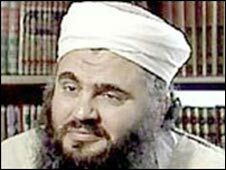 Abu Qatada became one of the UK's most wanted men in December 2001 when he went on the run, on the eve of government moves to introduce anti-terror laws allowing suspects to be detained without charge or trial.